A great, durable sleeping bag is essential for any outdoor excursion. Even in the summer months, the forest and mountain tops can get extremely cold at night. A sleeping bag that is both comfortable and functional will keep you warm and protected on all of your adventures whether you are setting up camp in the wilderness or in your own backyard. If you’re a seasoned camper, you want a sleeping bag with a long lifespan that can tough out the elements right alongside you without. If you don’t camp very often, you want to be confident in the fact that your sleeping bag will survive long stays in storage. With so many different products on the market, picking the best synthetic sleeping bag for you might seem overwhelming. Luckily this comprehensive guide should make your decision much easier. What Exactly is a Synthetic Sleeping Bag? Well, the insulation of a sleeping bag is what provides the warmth and padding you feel when nestled comfortably inside one. While some sleeping bags feature insulation made from natural down – the wispy tufts found underneath the feathers of ducks and geese. Synthetic insulation, on the other hand, is made of polyester filaments intertwined to imitate the feel of down. Synthetic insulation offers a whole host of benefits because it tends to dry more quickly than natural down and it is much cheaper. Because of these factors, synthetic sleeping bags are extremely popular among campers. And, hey, on the off chance that you’re allergic to ducks, there’s no reason to surround yourself with their plumage when synthetic sleeping bags offer such a great alternative. 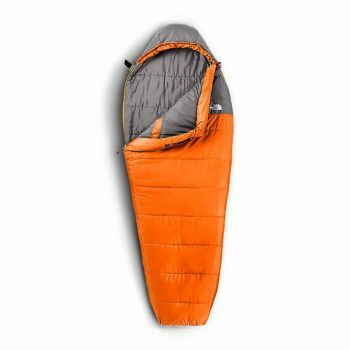 Even among synthetic sleeping bags, there are some differences in quality. Some synthetic sleeping bags are easier to compress than others. Softer synthetic sleeping bags will feel more similar to down and other, firmer models will retain warmth better over time despite being packed and unpacked. The more you stuff and unstuff your sleeping bag, the more the synthetic insulation will wear down, so synthetic sleeping bags are perfect for those casual campers and backpackers who might not use a sleeping back that often. When you imagine a sleeping bag, you probably picture a rectangular shape that zips shut around its user and provides basic comfort and warmth. However, sleeping bags are much more than that and knowing the different types will help you choose which one you need. The most common sleeping bag shape is a rectangle. Rectangular sleeping bags are roomy enough for those who may feel claustrophobic in a more tightly shaped sleeping bag. If space isn’t a major issue, you can even zip two compatible rectangular sleeping bags together to create one bag with double space, able to comfortably fit two people. A barrel-shaped sleeping will be even warmer than a rectangular sleeping bag and it will take up less room. Barrel-shaped sleeping bags are good for backpackers who may not have a great deal of space. A mummy sleeping bag has an even tighter fit than a barrel-shaped sleeping bag. They are perfect for people who have very little room to camp and who are comfortable with tight sleeping quarters. 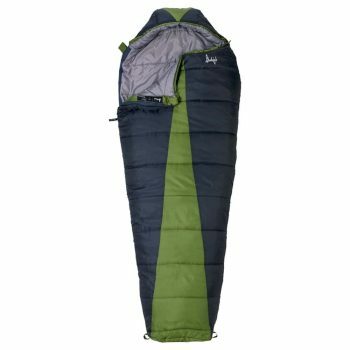 As the name suggests, a mummy sleeping bag offers little wiggle room due to their narrow shape, but they offer a great amount of warmth. Mummy sleeping bags don’t have to be folded and placed into their sacks. They can simply be stuffed in, saving time and effort. There are even sleeping bags specifically for women and children. Women’s sleeping bags offer more room in the hips and more warmth concentrated in the upper portion of the sleeping bag as well as in the feet. Children’s sleeping bags come with features designed for extra comfort. They can even be attached to compatible adult bags so that a child may sleep comfortably with his or her parent through the night. The season ratings of sleeping bags offer a general idea of which sleeping bags will be most appropriate in which climate. While some are acceptable for use year-round, other sleeping bags may only be recommended for warmer months. Because countries in different parts of the world experience different climates during the four seasons, checking the temperature rating of your sleeping bag will allow you to be more prepared for specific temperatures. Temperature ratings are more specific than season ratings. A sleeping bag’s temperature rating is extremely important and will offer insight into a particular bag’s best use. Not only does the temperature rating determine what climate a sleeping bag will best be suited for, but it also lets you know how cool or warm you can expect to be inside the sleeping bag. Some people can only sleep when they are quite warm, while others prefer to be relatively chilly. You may think that you are prepared to sleep outside with whatever elements may arise, but your body and mind will have an easier time sleeping through the night if the conditions match those of your bed at home somewhat. And you definitely want to be able to sleep through the night to better enjoy your time camping. Temperature ratings are split into comfort ratings and extreme ratings. A sleeping bag’s comfort ratings outline what temperature a sleeping bag should be used for its user to feel comfortable and protected from the climate. If you use a sleeping bag at a temperature below its comfort rating, you will likely feel cold and less comfortable in the sleeping bag. A sleeping bag’s extreme ratings refers to the absolute lowest temperature a bag can be used in while still keeping you from freezing to death and free of frostbite. This is important for campers and backpackers that brave the most intense climates, such as those on Mount Everest. It is still useful to know a sleeping bag’s extreme rating in case you find yourself experiencing an unexpected emergency. When deciding to purchase a synthetic sleeping bags, there are many factors you’ll want to consider. A clear understanding of how you will personally be using your sleeping bag will allow you to easier choose one that best fits your specific needs. Sleeping bags are usually made of nylon or dry loft. Nylon is very durable, and dry loft is extremely water resistant. The inner linings are typically comprised of polyester, nylon, flannel, or cotton. The level of breathability you desire and the temperature at which you’ll be using your sleeping bag will determine which is best for you. The type of zipper on a sleeping bag will also vary. Sleeping bags come with zippers on either the left or right side for both right- and left-handed people. Some even feature a second zipper layer to provide ventilation. The more insulated the zipper area of a sleeping bag is, the less heat will escape through the zipper. Sleeping bags will often feature hoods to give your head added comfort and softness. These hoods will also keep heat from escaping from your head and can usually be tightened with a drawstring to close tightly around your face. Understanding all of the features sleeping bags offer will give you a better idea of your specific needs and it should lead you to a well-informed decision when choosing a sleeping bag. Features: Rectangular shape, fits most 25” pads, includes soft integrated sheet and silky, synthetic comforter, temperature rating of 25 °F/-4 °C. The Nemo Symphony Sleeping Bag is perfect for those who don’t want to sacrifice comfort and spaciousness while camping. It provides great warmth, even in temperatures below freezing, without restricting its user. Because of its spacious dimensions, this sleeping bag will make you feel like more like you’re sleeping comfortably at home in your bed rather than in a sleeping bag. This sleeping bag includes a hood for added comfort and warmth, though the hood does not have a drawstring. 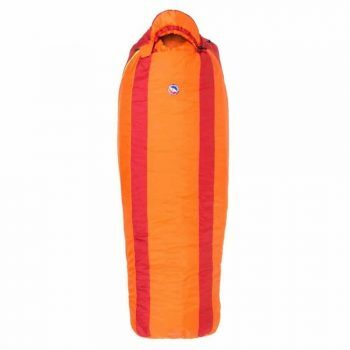 Because this sleeping bag is so large, cold spots can occur over time in areas such as the foot of the bag. It will still manage to keep you toasty, though, even in temperatures below freezing. Because of the integrated sheet and comforter, this bag cannot be zipped together with another to form a double-wide bed. Just one of these, though, is roughly the same size as a twin bed. This bag is a worthy, affordable investment that will last you through many outdoor adventures. Related: Nemo also offers the incredibly lightweight, stretchy, and comfortable grab-and-go Mezzo Loft Luxury Sleeping Bag. This bag can also be combined with a 25” sleeping pad. Features: Sculpted contour, full pad sleeve design, fits most 20” pads, 100% recycled insulation, temperature rating of 15 °F/-9 °C. The Big Agnes Encampment Sleeping Bag offers much more than the typical mummy sleeping bag. An integrated pad sleeve makes for a much roomier bag that is able to keep users warm and comfortable even if they tend to toss and turn at night or prefer to sleep on their side. The folks at Big Agnes made sure to include the pad without sacrificing the lightweight size that backpackers need in a sleeping bag. The way the bag contours to its user allows for a fully insulated experience without being uncomfortably constricting. The free-range hood will cradle your head while it’s zipped and cinched, even if you tend to move around. The bag is designed for optimum convenience, including interior and exterior fabric loops and two stuff sacks in nylon and mesh. This bag can be mated with another to create a double-wide sleeping bag. The warmth might be overkill for temperate climates, but the zipper goes all the way down to the bottom of the bag, giving users control. The recycled insulation material is designed to simulate real down, but the bag does not compress to quite the size that a down sleeping bag would. This is one of the more affordable bags on the market. Related: Big Agnes also offers the Encampment 15 sleeping bag in a wide/long size for more space. Features: Comfort-oriented, less tapered mummy shape, Heatseeker Eco insulation made from 30% recycled materials, temperature rating of 35 °F/2 °C. 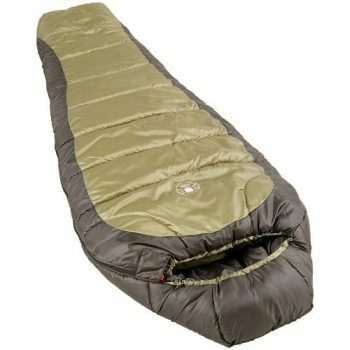 The North Face Aleutian Sleeping Bag is a bargain at around $100. Because of the full zippers, the bag can be converted into an insulated camping blanket for added functionality. The bag is lightweight enough to take camping or backpacking. The Heatseeker Eco insulation provides warmth in mild temperatures, but in colder temperatures, users will need extra thermal clothing or blankets to stay warm. This bag is best suited for warm weather adventures. Its relaxed mummy shape does not constrict users as much as typical mummy bags would, so this would be a good bag for someone who might move around some in his or her sleep. It would likely be too constricting for someone who moves around a lot, though or is claustrophobic. A vented foot area will keep your feet from getting overheated when using the bag. The bag compresses to be relatively small so it is an excellent choice for casual campers or backpackers who prefer to pack light. 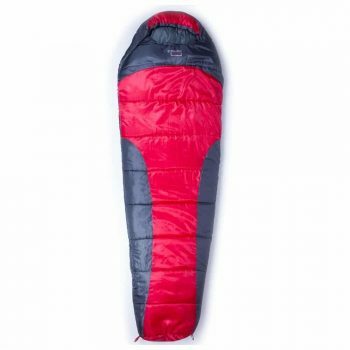 The North Face Aleutian 35/2 sleeping bag also comes in a long size for those who are 6’ or taller. The long size adds an extra 6 inches to the bag’s length. Features: Rectangular shape with sculpted contour, integrated pad sleeve, vaulted foot box, soft material, temperature rating of 30 °F/-1 °C. The Big Agnes Gunn Creek Bag is perfect for backpackers of all experience levels. The rectangular shape and vaulted foot box allow users to move around comfortably and sleep on their sides while inside the bag. This bag is insulated with 97% recycled materials that are designed to simulate the feel and softness of real down insulation. Backpackers love this bag because it is durable while remaining very lightweight. It is not recommended for cold climates, though, as the back of the sleeping pad is not insulated. To remedy that, users can keep warm with a thermal pad liner or extra covers. The built-in pillow pocket will hold pillow padding for added comfort, and interior fabric loops add convenience for those who hope to use sleeping bag liners. 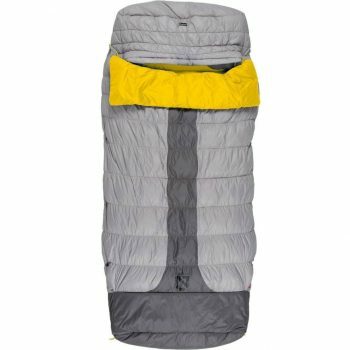 Related: The Big Agnes Gunn Creek Sleeping Bag also comes in a long size which adds an extra eight inches to the bag’s length. You can check it out from Big Agnes’ official website. Features: Mummy shape, ComfortSmart Technology for comfort and durability, warm insulation for extreme weather conditions, temperature rating of 0 °F/-17 °C. The Coleman North Rim Sleeping Bag is true to its name and perfect for camping or hiking in very cold temperatures and climates. The bag is fully polyester from the ripstop lining to the insulation inside. The hood is semi-adjustable for comfort and warmth, preventing warmth from escaping out the top of the bag, and the bag’s quilted design prevents cold spots from forming quickly from lots of compressions. The Thermolock system prevents warmth from escaping through the zipper, a common issue with sleeping bags. The zipper also features Coleman’s patented two-way no-snag system that allows users to zip and unzip the sleeping bag with ease, avoiding the surrounding fabric. The bag is heavier and bulkier than others so it might not be the best choice for a backpacker who wants to pack light. This bag is an incredible bargain, providing high-quality materials and extreme warmth. 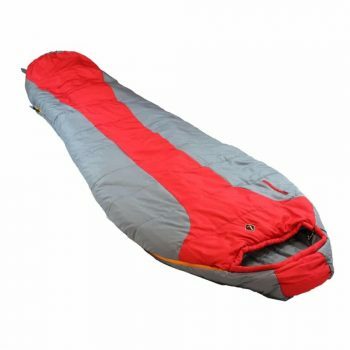 Related: The Coleman Big Basin Extreme Weather sleeping bag is perfect for someone who needs a bag fit for very cold temperatures but prefers a looser, rectangular shape. Features: Loose mummy shape, Slumberloft polyester insulation, two layer construction, temperature rating of 20 °F/-7 °C. The Slumberjack Synthetic Sleeping Bag offers snug comfort for those braving colder temperatures. The bag offers plenty of room in the foot area so that users may sleep in a natural position. Because of the hybrid mummy-rectangular shape, this bag offers more room to move around while still contouring to users’ bodies and keeping them warm and insulated. The bag features a snag-proof zipper, but it is not always the most effective and snags can still happen. The bag comes with a stuff sack but not a compression sack. It should fit a compression sack of a small/medium size. This bag is effective in damp conditions and will stay dry through a light sprinkle. While the temperature rating of this back boasts 20F, that might be too generous as users may get cold in temperatures below 35F. This bag would not be best suited for extremely cold temperatures. The bag is still fairly priced and would be appropriate for those camping in milder climates. Related: The Slumberjack Latitude 20 Degree Sleeping Bag comes in both short and long lengths as well. The short length is 5’6” long while the long length is 6’6” long. Features: Mummy shape, Hibernate Extreme continuous filament fiber insulation, temperature rating of 20 °F/-7 °C. 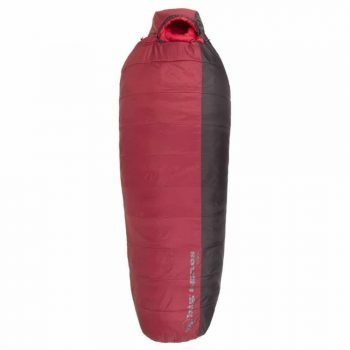 The Ledge Sports Featherlite +20 F Sleeping Bag is a great choice for more seasoned and experienced backpackers. The mummy design will hold users tightly when space is not in abundance. This is a very small bag, so those who are comfortable sleeping in a snug mummy bag will appreciate this, but those who require more room and spaciousness will probably not prefer this bag. Unlike the other bags on this list, the temperature rating for the Ledge Sports FeatherLite 20F is not so much a comfort rating as a guide for use. Cold sleepers will need extra covers and warm clothing to be able to sleep comfortably in this bag. If you are planning on relying solely on the bag for warmth, it would be best treated as a 35F bag. This bag is perfect for backpackers because it can be compressed to a very small size in its compression bag and it is lightweight. This bag offers a huge bang for the buck for experienced backpackers. Related: Ledge also offers FeatherLite Bags for much colder conditions including a 0F bag, a -20F bag, and a -40F bag. These are also best suited for experienced backpackers who are prepared to utilize the proper equipment along with this bag. Features: Mummy shape, 260-thread count microfiber lining, 100% hollow fiber polyester insulation, temperature rating of 40 °F/4 °C, extreme temperature rating of 0 °F/-17 °C. The Rovor Couzy Sleeping Bag, named after famous mountaineer Jean Couzy, is perfect for those wanting to camp in extreme conditions. Because of its versatile temperature rating, this bag is appropriate for camping in all four seasons. It is the most affordable bag on this list. With such a low price, one might think he or she was sacrificing quality or durability but that is not the case with this bag. With a recommended height of up to 7’, this is an incredibly tall mummy bag, perfect for those who require lots of wiggle room in the foot area. The reinforced mini-diamond ripstop polyester shell repels water to keep users comfortable even in damp or snowy conditions. The bag’s interior offers great comfort and an extremely soft, bed sheet-like feel. Because of this bag’s long length, it weighs more than other sleeping bags. It would probably be too heavy and bulky for a backpacking trip, but more suited for a camping trip by car. Other bags that offer similar specifications are much more expensive, so this bag is an incredible bargain for the quality. Rovor bags also feature lifetime warranties which make the price even more astonishing. Related: The Rovor Buhl 14-45F Mummy Bag is very similar to the Couzy 0F. It offers a temperature rating of 14F in extreme conditions and 45F for comfort. If you are wanting an affordable bag for three season camping, this one provides what you need. Which Bag is Best for You? Knowing your perfect synthetic sleep bag’s intended purpose is the first step to choosing the right bag. If you are an extreme backpacker, one of the mummy bags with a low temperature rating and lightweight compression packing would be a good fit. If you are a more casual camper who craves the comfort of your bed at home, a rectangular bag with soft insulation will treat you right throughout the night. While some of the best bags can be a bit pricey, you never want to overpay for your sleeping bags. Compare the bags listed above and decide which bag fits your needs and your budget. You can always go to a local outdoor store to inspect and feel the bags in person. You never know, it could be love at first sight.